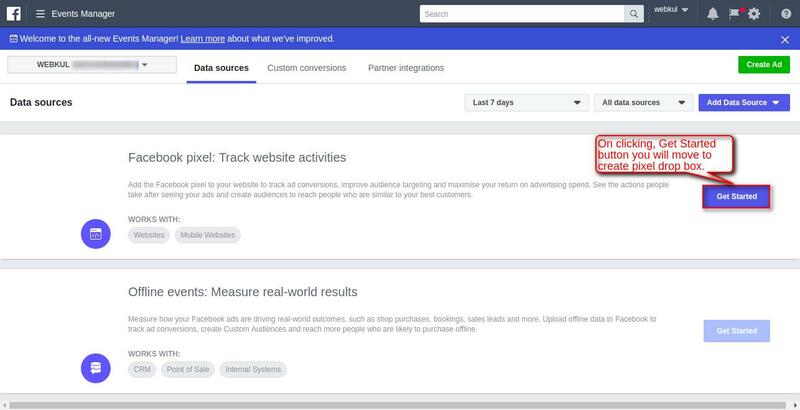 Facebook pixel is an analytic tool which allows you to measure, optimize and build audiences for your advertisements by understanding the actions people take on your website. The Facebook Pixel tracks which page the visitor has visited, what all the products they have bought and much more. 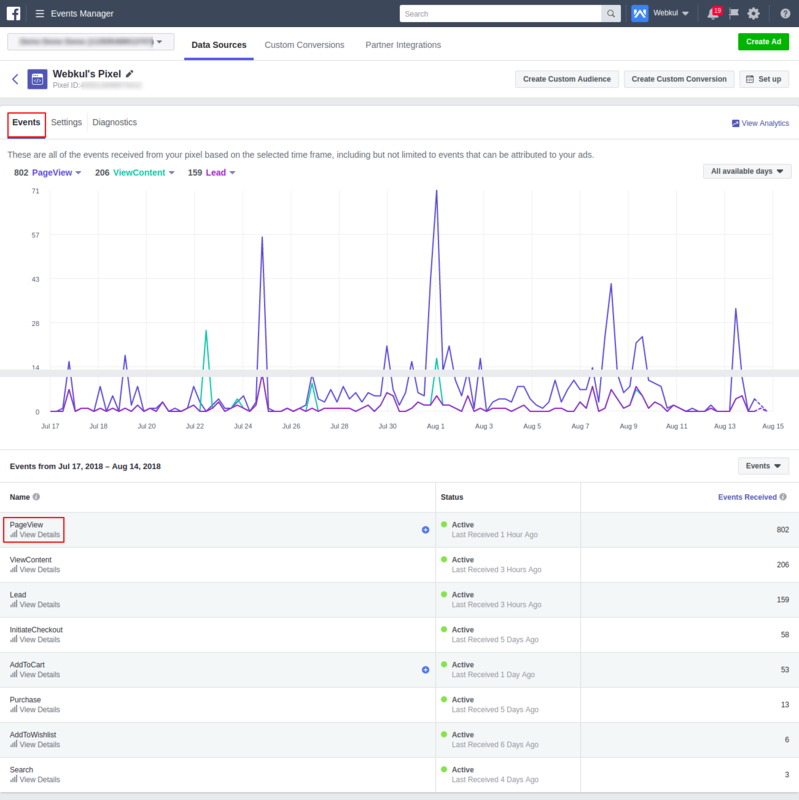 Using Magento 2 Facebook Pixel module you can integrate this analytics tool to your Magento store. This will allow the store owner to track visitors and their behavior on your website. This eventually helps the store owner to build targeted audiences for future ads, and remarket to recognized leads for people who have interacted with your website or performed some sort of actions. It works by placing and triggering cookies to track users as they interact with the website. Integrate Facebook Pixel to your website. This module can be completely disabled whenever required by admin panel. Can add multiple Facebook Pixel IDs as per multiple store views. Track standard events like Product View, Category View, Add to Cart, Add to Wishlist, Initiate Checkout, Purchase, Product Search, and Customer Registration. Each event can be enabled or disabled separately. Can create the custom audience and reach them via targeted Facebook ads. Can also target your audience via dynamic Ads. But for dynamic ads, you need to have your product catalog on Facebook as well. 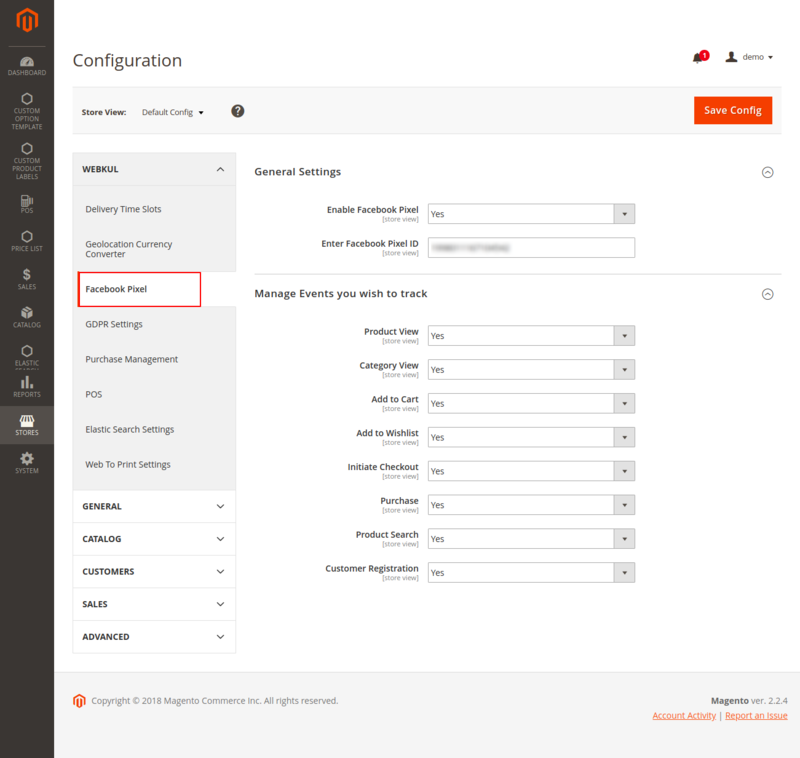 Easy access to manage the module configurations by admin panel. If you need to do the module translation, please navigate to the following path in your system – app/code/Webkul/FbPixel/i18n. Open the file named en_US.CSV for editing as shown in the below screenshot. It supports both RTL and LTR languages. 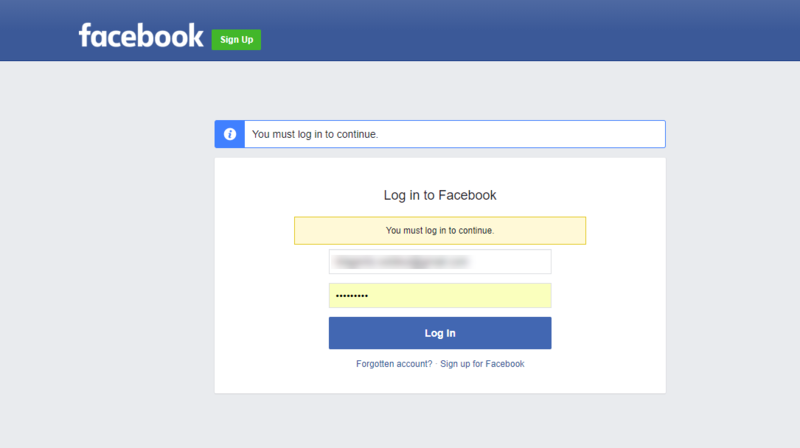 After login, you get navigated to the Facebook Event Manager account of your Facebook. Note: Click on Login if you already have a Facebook account. Else click on Sign up to create the facebook account first. Here, after clicking on “Get started”, you will get a pop when you will click on the Create button. After clicking on the Create button you will get a success message as per the below image. After this, you will get the Facebook Pixel ID. After installing the module and creating the Facebook Pixel ID, the admin will configure the module settings. 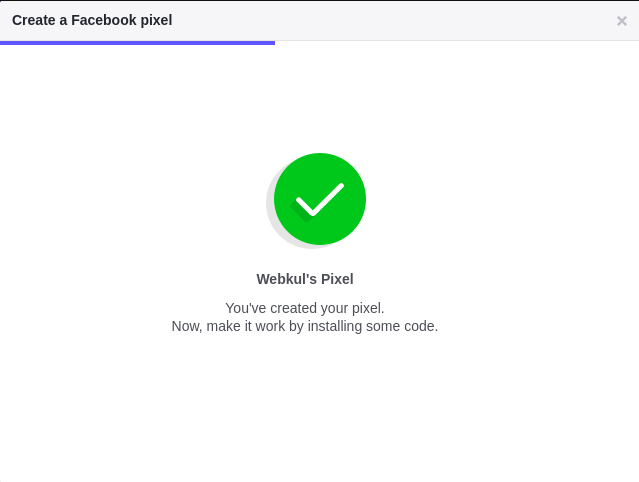 For this, the admin will navigate to Stores -> Configuration ->webkul ->Facebook Pixel. This will navigate the admin to the module configuration page. Enable FB Pixel: enable or disable the module. There are various store events that can be tracked using this module. Each event can be enabled or disabled separately. 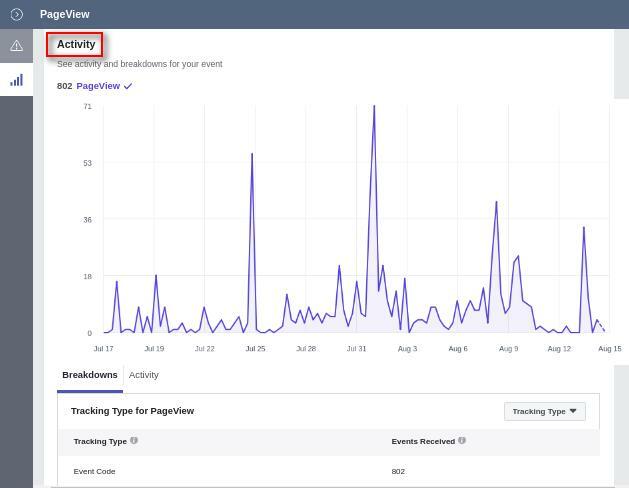 Product View – track event when someone visits the product page. Category View – track event when someone visits the product page. Add to Cart – track event when someone clicks on ‘Add To Cart’ button to adds a product to the cart. Add to Wishlist – track event when someone adds a product to the wishlist. Initiate Checkout – track event when someone lands on the checkout page. Purchase – track event after someone places an order in your store. Product Search – track event when someone searches for something using the search feature. 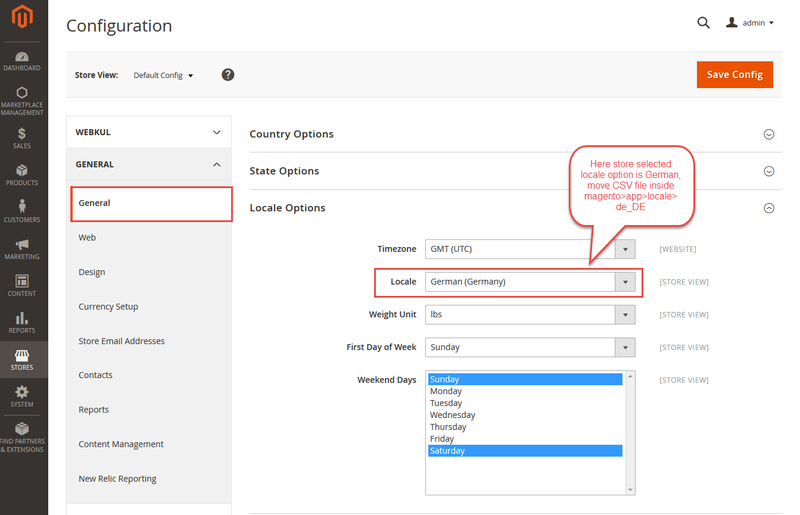 Customer Registration – track event when someone creates an account. Once you have configured the module settings, log in to your Facebook Business Manager account. In the Data Sources section, select the Events tab as shown below. The admin can view Events and can view details of the Event by selecting “View Details“. On selecting View Details, a pop box will appear as shown below. Here, the admin can track the information for all the dynamic events of the Magento store conveniently. The admin can even verify individual pages and make sure that the events are installed correctly. For this, the admin needs to install the Facebook Pixel Helper as a chrome extension. This is optional. Facebook Pixel Helper is a tool that checks the accuracy of the Facebook Pixel and tests that the pixel is working fine. Please Note – Facebook Pixel will not work if any ad-blocker is enabled in your browser.